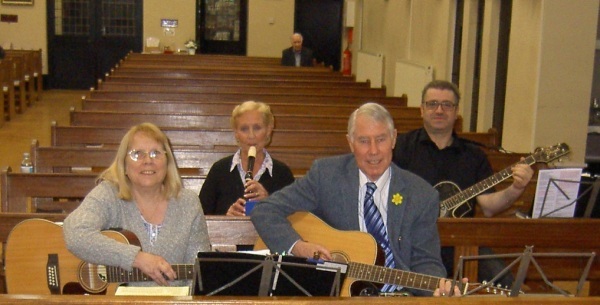 THE FOLK GROUP in our church, (consisting at present of three guitarists and one treble recorder player), play for every Sunday evening Mass at 6 pm and occasionally for a morning Mass, if needed. They also play for the First Communion and Confirmation Masses, (which both take place once a year), plus weddings and funerals when required. Christmas and Easter services are always top priority for them too. 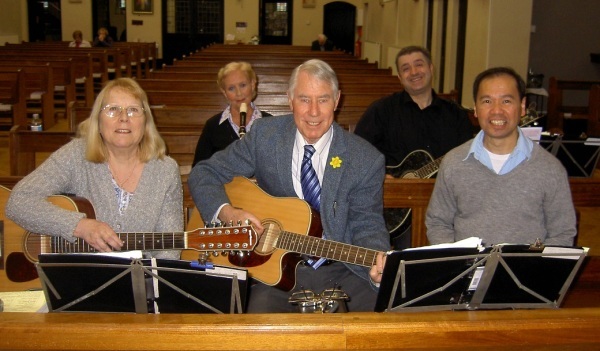 The Folk Group began in 1979, with quite a large group of parishioners of mixed ages and musical instruments. 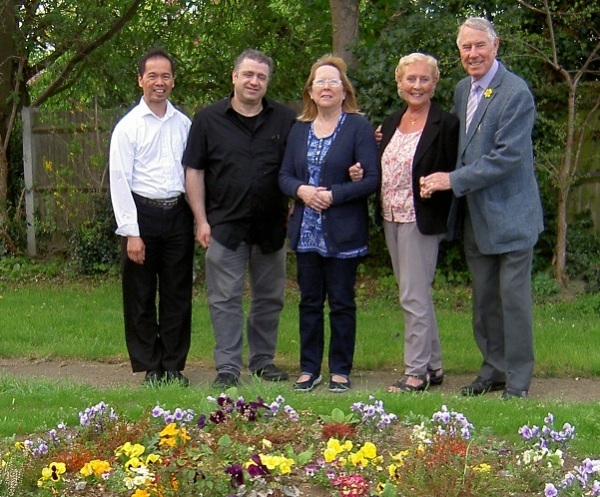 Over the years, many have come and gone, but two original members still remain in the group, Maureen & John Endicott, whose children and grandchildren have also been in the group at various times. Maureen runs the Folk Group and has attended to all the music for nearly 40 years now, and still finds it ‘a labour of great love and joy’. She plays the treble recorder and her husband, John, plays guitar and is a strong singer. Marilyn Campbell-Carr, who also plays guitar and sings, joined the group with her husband Malcolm, in 1983. Malcolm who is a wonderful bass guitarist, singer and composer, has now retired from the Folk Group with the debilitating illness, Multiple Sclerosis. He is greatly missed by our whole church. Their children were also in the group for many years. Vincent Geluz-Bustos, is one of the Folk Group's regular singers and comes from the Philipines. He owns the Atrium Restaurant in Rochester High St., where Carlo sings and plays guitar to crowds of diners every Sunday afternoon..
St John Fisher Catholic Church, Rochester © 2016. Part of the Catholic Archdiocese of Southwark.